Biomass extraction for energy is one of many interacting factors influencing the development of forest carbon stocks. Forest management to supply other product markets* , the forest ecosystem structure (species composition), and natural conditions (climate, soil type, topography) also have an impact on development of carbon stocks. In a sustainably managed forest, silvicultural operations and harvest activities are coordinated across the forest landscape to maintain a healthy forest and to obtain a continuous flow of wood for society, while maintaining or increasing wood volume in the forest. Carbon losses (through harvest) in some stands are balanced by carbon gains (growth) in other stands, so that across the whole forest landscape the fluctuations in carbon stock even out. In their fifth assessment report, IPCC stated that in the long term, such sustainable forest management strategies will generate the largest sustained greenhouse gas mitigation benefit from forests (through the combination of maintaining/increasing carbon storage in the forest, and replacing carbon-intensive materials and fossil fuels). 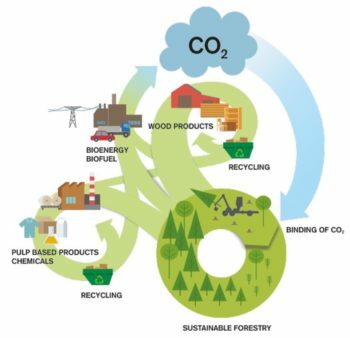 * Forest bioenergy systems are often components in value chains or production processes that also produce material products, such as sawnwood, pulp, paper, and chemicals. Climate impacts of bioenergy are commonly quantified by comparing with a reference “no-bioenergy” scenario. Some claim that forests would remain unharvested and continue to grow in the reference scenario; however, extraction of biomass for bioenergy is generally not the main economic driver for wood harvests. Moreover, unharvested forests have declining carbon uptake over time because growth rates diminish as forests get older and approach maturity, or high tree density constrains further growth. As growth rates decrease, the forest moves towards a steady-state, where carbon uptake is balanced with the carbon release from decaying trees that died from natural causes. Unmanaged forests are also at greater risk of disturbance from fires, storms and insect attacks, which can lead to high decreases in carbon stocks. Thinning, where some smaller trees are cut to promote better growth of the remaining trees, is the main method of influencing growth and development in production forests. Thinning promotes the production of high-quality stemwood and can stimulate increased growth rate of the forest stand. Thus, utilisation of thinned trees for bioenergy is beneficial both to the carbon balance of the forest-product system and also to future production of high-value timber (harvested stemwood), which is typically much less greenhouse-intensive than alternatives such as concrete, steel or bricks. Forest management is linked to economic incentives and market expectations of forest owners for different forest products. Emerging bioenergy markets, along with the outlook for other forest product markets, influence the decisions of forest managers. A market for bioenergy can support investment in forest improvement – to enhance health and productivity of the forest, which in turn positively influences forest carbon stocks. For example, forest owners that are positive about future forest product markets may implement measures to protect their forests against disturbances, replanting and tending the forest and introducing more productive tree species and provenances where appropriate. They may also be less inclined to convert forested areas to agriculture or other land uses in regions where legislation does not prevent conversion, and they may even be inclined to increase the forested area. Moreover, reforestation and afforestation of degraded lands results in carbon sequestration in biomass and soils; to the extent that bioenergy demand is a driver for such activities this carbon sequestration can be considered an additional contribution to climate mitigation provided by the bioenergy system.